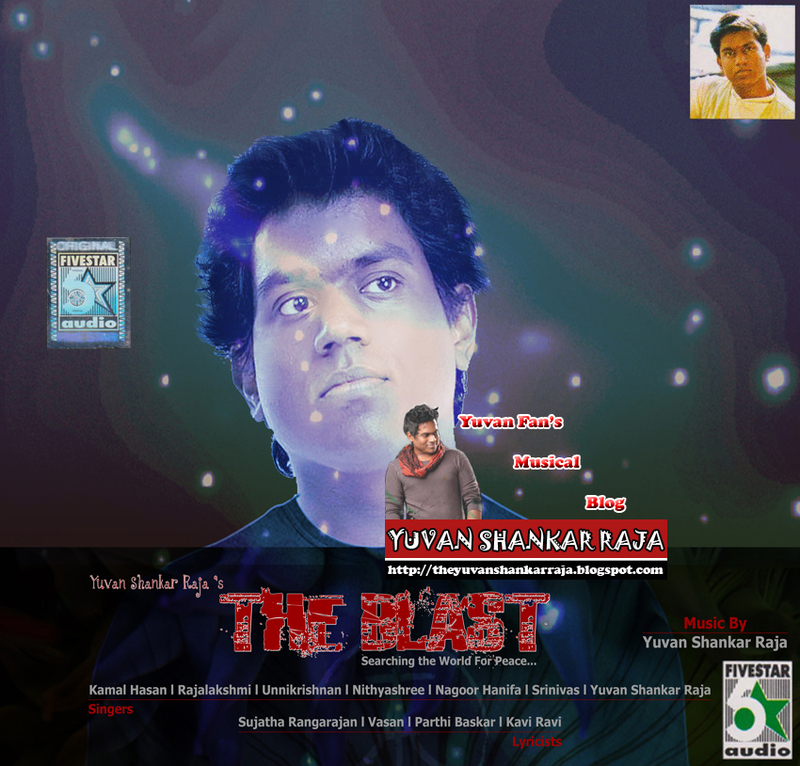 The Blast is the first Indipop studio album by Indian musician Yuvan Shankar Raja, released in July 1999. It features 12 tracks, which were all composed by Yuvan Shankar Raja. Yuvan Shankar Raja started working on an independent studio album, even before stepping into the Tamil film industry, working as a film composer and music director. It was, in fact, this album, which made possible his entry into film business, since producer T. Siva approached and eventually assigned him to compose the score for his 1997 Tamil film Aravindhan, after having listened to a couple of tracks, Yuvan Shankar had composed from this album. He worked for nearly 2 years on this album, which finally got released in July 1999. But since he wasn’t popular and not a household name yet during the time, his album went totally unnoticed and failed to gain attraction, though featuring some very popular artists as actor Kamal Haasan, Carnatic-based singers Nithyashree Mahadevan, Unnikrishnan and Srinivas. According to Yuvan Shankar Raja, the album is based on the thought of World Peace. He tells, that during the time, he was working on this album, India was carrying out Nuclear testing, which he had used as the inspiration, from which also the title is derived. Following People’s has been Credited for vocals: Yuvan Shankar Raja, Kamal Hasan, Rajalakshmi, Srinivas, Unnikrishnan, Nithyasree Mahadevan, Nagoor Hanifa. Following People’s has been Credited for lyrics: Sujatha Rangarajan, Vasan, Parthi Baskar, Kavi Ravi. Keywords: The Blast, Yuvan’s The Blast, The Blast Yuvan Shankar Raja, Yuvan’s Personal Album The Blast, The Blast 1999, U1 The Blast. The single track of ‘Vaanam’ was released on November 28th in the Citi Center Mall in Chennai in the midst of fans. The single track launch event was graced by big personalities in Kollywood. The track was launched by K.S. Ravikumar, Sun Pictures Hansraj Saxena along with Silambarasan, Yuvan Shankar Raja and producer R. Ganesh, lyric writer Na. Muthukumar and Premji Amaran. Yuvan Shankar Raja nearly took more than two months for composing this song. Silambarasan and Yuvan are joining hands for the fourth time as they previously worked for ‘Manmadhan’, ‘Vallavan’ and ‘Silambattam’ and all the films were musical hits. Silambarasan has sung the song and Yuvan too added his voice for the English part in this song. The song ‘Evan Di Una Pethan’ keeps us refreshed with its simple and haunting lyrics. No doubt Yuvan has given an exceptional track for Vaanam. The song is also mixed with English lyrics which gives a pleasant feel. Yuvan Shankar Raja’s thundering Techno orchestrations throws high fever of musical feasts amongst the listeners. It’s sure to be a chartbuster of this year. The English lyrics are penned by U1 and Yuvan renders it on his own style. Lots of DJ works emblazons the song to a greater magnitude and you can feel the effects with your surround system. The very starting line – Evan Di Una Pethan… Avan Kaila Kedaicha Setthan itself grabs out our attention. “Evan Di Unna Pethan” (Tamil: எவன்டி உன்ன பெத்தான்) is a song by Indian artist and film composer Yuvan Shankar Raja. A part of the soundtrack album to the 2011 film Vaanam, it was released as a single track on 28 November 2010, in order to promote the film. The song predominantly features vocals and lyrics by Vaanam’s lead artist, Silambarasan, while Yuvan Shankar Raja has also penned parts of the English phrases, performing them himself. This song is notable as being the first single track to be released promotionally for a South Indian film. The track, upon release, became highly popular, with the attempt being declared a great success, while drawing notable attention particularly for its lyrics. Following the positive response, the song is being remade as a music video into Hindi, featuring Silambarasan himself. Composer Yuvan Shankar Raja has become busier than his usual self. The tunesmith surely does have added responsibilities post his second marriage. Yuvan entered wedlock with Shilpa (a Doctor by profession) on Sep 1st, 2011. Juggling between his personal and professional commitments, the pressure seems to have increased a wee bit more with multiple albums being polished up in his studio. Howsoever the composer was more than happy to share one of the comments he got from his fans saying “If it is “Rajini – Ilayaraja” in 80s – 90s then its “Ajith – Yuvan” in 2ks… Love u bro ”. U1 is presently engaged with upcoming biggie Thala Ajith project Billa 2 as he quips, “Billa 2 has some super tunes and the theme will rock for sure.” Apart from Billa 2 there is quite a long list of releases in Vikram’s Rajapaatai , a Telugu movie titled Shadow with Pawan Kalyan and another flick in Thanga Meangal. About his Vikram movie U1 disclosed, “I have completed recording 2 songs for Rajapaatai and also composed one fresh tune just now thinking to make Vikram sing in one of the tunes”. U1 fans are also awaiting his Hollywood hip-hop album due for release next year. That’s a load of releases coming your away from the one and only U1(Yuvan Shankar Raja). Yuvan Shankar Raja is composing music for the first time to a Pawan’s movie and he was excited about the first track which is ready. Yuvan tweeted before that “Awesome track is on da way for Kaali guys really tripping on this one! Vishnu n me r excited bout this one!!“. 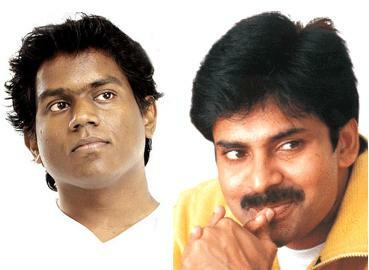 Recently Yuvan tweeted that “Pawan Kalyan’s Shadow Music will be definitely Big”. Yuvan Shankar Raja has composed scintillating tunes and many big music companies are bidding for its rights. Vishnuvardhan the director of the movie is currently shooting its last schedule in ramoji film city, Hyderabad. This will end by this weekend and then director wanted to work on postproduction for atleast 2 months. Sanghamitra arts and Arka media are jointly producing this movie and are planning to release this movie’s music on 2nd november 2011. Movie is planned for December release. Vishnu is also planning simultaneous tamil version release in December. Movie’s 1st look poster and official title will be released next week on 6th october(Dasara). The soundtrack to the film is composed by Yuvan Shankar Raja, which was released on February 02, 2011. Though earlier reports claimed Yuvan Shankar Raja had composed six songs, the album featured only five songs, with four of them being duets. The album begins with “Vennira Iravugal” which is sung by Yuvan Shankar himself. Apart from him Haricharan, Roshini, Krish, Rajalakshmi, Rahul Nambiar, Reeta, Vijay Yesudas and Priya Himesh have sung the songs. The album contains a song “Kettimelam” which consists of Hindi lyrics along with Tamil. The album has been receiving positive reviews. All lyrics written by Snehan, except “Vennira Iravugal” Song which was written by the director Ra. Cyril. The film is the directorial debut of Ra. Cyril, a former associate of noted directors Kadhir, Durai and Kala Prabhu. According to Cyril, the film will have mainly two color tones, green and white. As the film is said to start in winter and end in spring season, the entire first half of the film will take place in hilly regions with the colour green as its backdrop, whilst the second half will be completely filmed in snowy regions, where the colour white will be the backdrop. The scenes of the first half were shot in Udhagamandalam (Ooty), Kodaikanal and other hill stations, whilst the sequences of the second half were filmed in Himalayas and specifically in Kulu-Manali. A grand railway station was erected at Kulu Manali at a cost of 30 lakhs, while a church was also created there. Pesu (Tamil: பேசு; English: Speak!) is an upcoming Indian Tamil romance film written and directed by debutant Ra. Cyril. It stars newcomers J. Vignesh and Vibha in the lead, and Jayaprakash, comedian M. S. Baskar, Mahadevan and Ajay Ratnam in supporting roles, whilst featuring film score and soundtrack by noted composer Yuvan Shankar Raja. The film is currently in its post-production stage and set to release in 2011. Yuvan Shankar Raja is definitely on a roll. His Vaanam is making waves and his next audio release comes in the form of debut director Millind Rau’s Kadhal 2 Kalyanam. This film is about the journey from love towards marriage and has Arya’s brother Sathya making his acting debut as a Radio Jockey. He is paired with Divya Spandana and the rest of the cast includes Anuja Iyer, John Vijay, Nagendra Prasad and Kasthuri. Looking at the genre of the film, it appears to have a lot of scope for music. Has Yuvan scored a sixer with this one too? Read on, for the answer. The song starts off with slow paced and low volume beats which gain momentum on the way to become fast and loud. The lyrics of Snehan add to the mischievous mood of the voices which are very contemporary. Western instruments dominate this number with a lot of sound mixing. Chinmayee’s voice adds to the peppiness quotient with Benny Dayal’s base voice complementing it. Ithu Kadhalai Irundhidumo is a perfect blend of melody and foot tapping beats. This song is an impressive solo by Krish. A short number spanning for less than four minutes, it has fast beats and plenty of guitar strains and bass. The lyric by Snehan is very youthful but never goes overboard. It goes, “Natpin kadhaigalai neengalum konjam kelunga” and we definitely love to hear the song till the very end where it fades away slowly. Extremely funny lyrics, is the first thing that strikes you about this song. Though feminists might call the lyrics chauvinistic, it is sure to be a hit with the boys. The beats are different- like a mix of ‘dappankuthu’ and western. Yuvan usually stands out for singing in high pitch (Kadhal Solla, Iragai Pole) but here his voice remains in the low note and he does full justice to it. A perfect dance number, this song is a potential hit. Hearing this song makes us wonder why SPB Charan doesn’t sing more often. There is something magical (should I say SPB like?) in his voice that makes the hearing experience a delight. This is a soft song with strong drum beats. The keyboard and flute piece before the second stanza is commendable and adds value to song. This song is characterized by heavy metal beats and a heavier bass guitar. The song just storms past with high speed and Toshi’s fast singing fits well with the music. Somehow, the lyrics and the singer’s voice give the feel of hearing a retro song in the lines of MS Viswanathan’s Engeyum Eppothum from Ninaithaale Inikkum. A mix of conventional and unconventional music, this song surprises you with every passing minute. The traditional and classical-sounding flute music in the middle of the song blends beautifully with what follows. Naresh Iyer’s melodious voice and Andrea’s husky one gets together with surprising ease. The pace also picks up and falls down alternately on the whole making the song a unique listening experience. Verdict: One more treat from Yuvan! Kadhal 2 Kalyanam is surely a well produced album and Yuvan has a love for playing around with the vocals of his singers particularly , some of the songs are really standing out and provide the much needed contrast to the whole album .Have a listen guys you will certainly like it. Both Arya and Sathya went through many scripts before selecting the script of Kadhal 2 Kalyanam, in which Sathya would be essaying the role of a radio jockey. Sathya, after being assigned for the role, had visited Bollywood actor Anupam Kher’s acting school in Mumbai to “hone his acting skills”, before starting to shoot, besides sitting with and observing professional radio jockeys at a radio station. Divya Spandana signed the film in October 2008, shortly after completing her third Tamil film Vaaranam Aayiram, describing her character as a “career-oriented, independent woman in the corporate world.” Further more, former lead actress Jayashree was signed in November 2008 for a significant role, which would mark her comeback to feature films after a decade. In December 2008, Kasthuri was roped in to appear in a supporting role and play the wife to the character essayed by Nagendra Prasad, while John Vijay accepted to play a drunkard in the film. The film’s shooting, however, got stalled midway in 2009 due to unknown reasons and was resumed in 2010 only. Since a large part of the film would take place at a radio station, art director Rajeevan erected a radio jockey booth in Chennai. The film notably became the first film after 40 years to be shot at all the six most important shrines of the Hindu deity Muruga, the Arupadaiveedu (“Six abodes”), in Tamil Nadu, with a specially designed bus being used for the tour. One of the songs, “Vellai Kodi”, was shot in Thiruchendur, one of the six towns of Murugan’s abodes, with Nagendra Prasad choreographing the song, besides appearing himself in it, while “Thedi Varuven” was shot in Pondicherry. In July 2010, two songs were canned; a “bachelor song” (“Naa Vetta Pora Aadu”), choreographed by Robert, was filmed at a farmhouse near Red Hills, in which Sathya and Divya, along with junior artists, took part, following which the last song (“Idhu Kadhalai Irunthidumo”) was shot. Rajeevan had erected a special “jungle set” at AVM Studios for the song, which was choreographed under the direction of Dinesh. With the completion of the song, the shooting was eventually finished after one-and-a-half years.